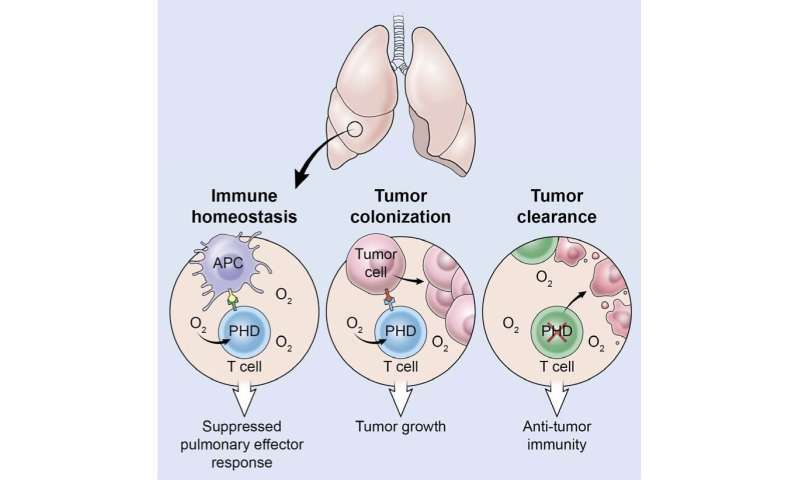 "Since the lung is one of the most frequent sites to which cancers spread, we hypothesized that there might be unique immunologic processes that aid tumor cells in their ability to establish themselves in the lung. Because oxygen is a pervasive local environmental factor in the lung, we wanted to examine what role oxygen might play in regulating immunity in the lung," said David Clever, a M.D., Ph.D. candidate who trained in Restifo's lab, and has now returned to the Ohio State University College of Medicine. To test whether PHD proteins promote tumor cells to grow in the lung, the researchers used a "knockout" mouse strain that lacks PHD proteins in its T cells. These PHD-knock-out mice, as well as unaltered normal mice, were injected with melanoma cells. Strikingly, whereas normal mice showed large amounts of cancerous melanoma cells in the lungs, the mice whose T cells lacked PHD proteins showed almost no evidence of melanoma in the lungs. Given their finding that PHD proteins suppress the inflammatory immune response in the lung, the researchers wondered whether inhibiting them might improve the efficacy of adoptive cell transfer, a type of immunotherapy that harnesses the ability of a patient's own T cells to recognize and attack cancer. In adoptive cell transfer, T cells are extracted from a patient's tumor tissue, expanded to great numbers in the laboratory, and then administered intravenously into the patient along with a T-cell growth factor, with hopes that these cells will return to sites of cancer and eliminate it. For these experiments, the research team expanded the antitumor T cells in the presence of a drug called dimethyloxaloylglycine (DMOG), which blocks the activity of PHD proteins. In the lab, the drug treatment improved the cancer-killing properties of the T cells and when administered to mice with established metastatic cancer, the drug-treated T cells were far better at eliminating cancer than untreated T cells. DMOG treatment has also been found to improve the cancer-killing properties of human T cells in other studies. The application of these findings to human adoptive cell transfer immunotherapy clinical trials is being investigated by Restifo's group. 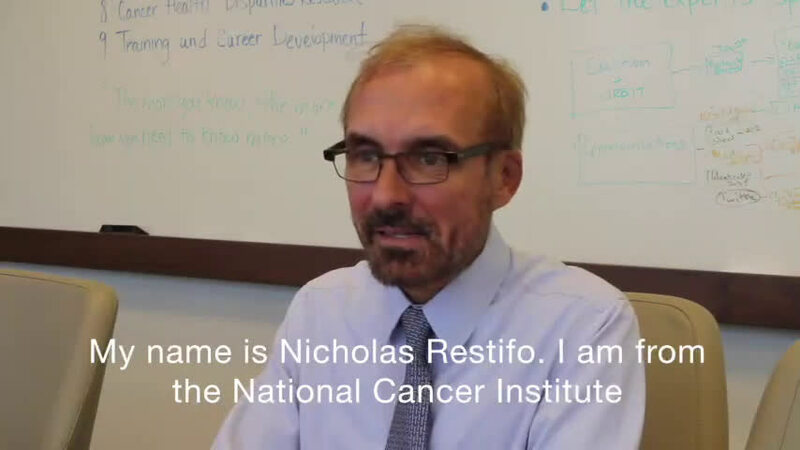 "Adoptive cell transfer immunotherapy provides a unique opportunity for manipulation of a patient's own T cells out of the body," said Restifo. "Although our finding is in mice, we are eager to test whether disruption of the oxygen sensing machinery in T cells—with drugs, genetics, or regulation of environmental oxygen—will enhance the efficacy of T-cell mediated immune therapies for cancer in humans."